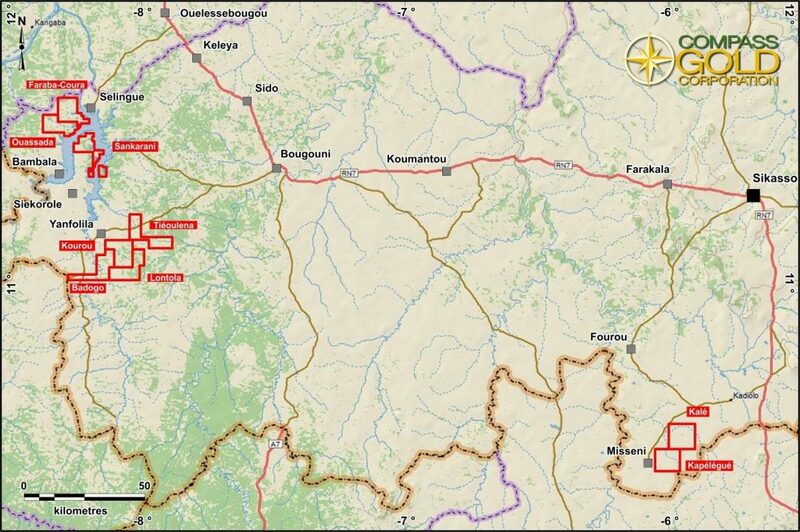 Today, the Sikasso Property consists of nine prospecting permits covering an area of approximately 850 sq. km. and is located within the Sikasso Region of the Republic of Mali (Figure 4-1). The Property divided into three permit blocks: Yanfolilia North, Yanfolila South, and Kalé (Figure 4-2). The Yanfolila North block consists of the adjoining Faraba-Coura and Ouassada permits, and the non-contiguous Sankarani permit (Figure 4-1), and covers an area of 254 sq. km. The Yanfolila South block comprises the adjoining Kourou, Tieoulena, Badogo and Lontola permits, and covers an area of 400 sq. km. The Kalé block covers an area of 200 sq. km, is composed of the Kalé and Kapéléngué permits, and is situated approximately 230 km east-southeast of the southern Yanfolila permit. 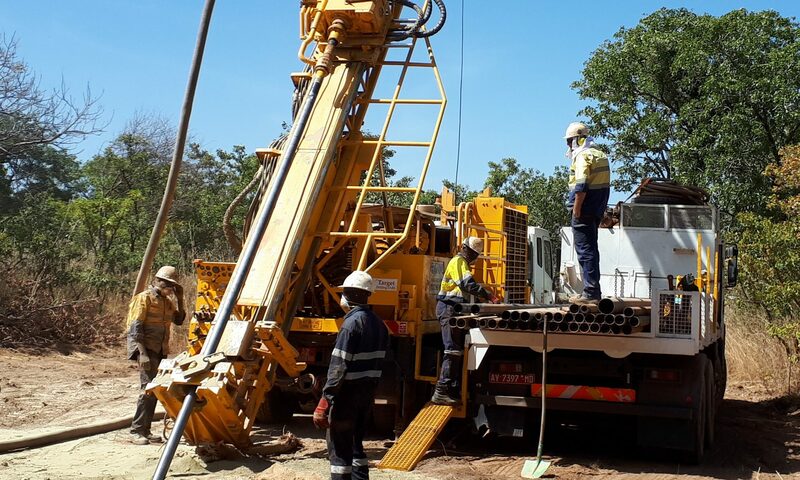 All permits are owned by Compass's subsidiary Mali Gold Exploration Pty Ltd ("MGE"). The Republic of Mali comprises a total area of 1,240,192 sq. km. The country is bounded by Algeria to the north, Niger and Burkina Faso to the east, Ivory Coast and Guinea to the south, with Senegal and Mauritania to the west. Note: International boundary indicated by light brown line, and Sikasso Region with a purple line. Currently and historically, the Birimian greenstone belts of the West African Craton host significant accumulations of gold as exemplified by deposits such as Obuasi (Ghana), Morila, Loulu-Gounkoto, and Syama (Mali), and Essakane, Burkina Faso. 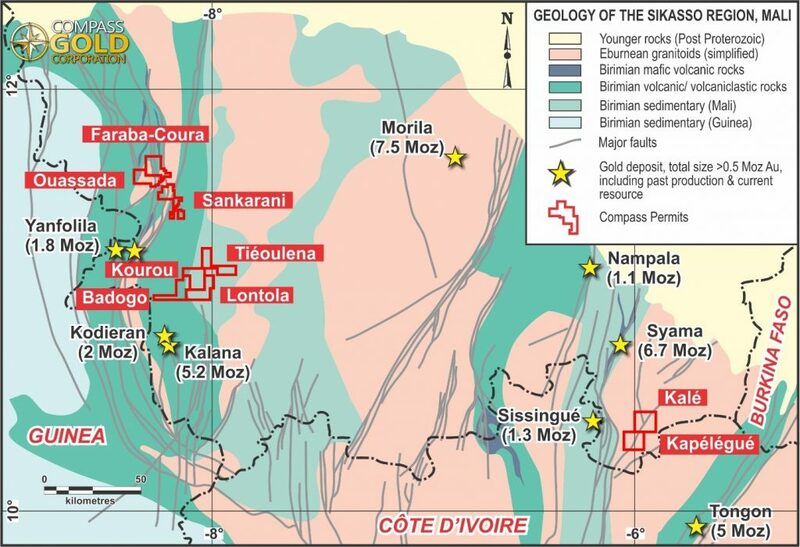 The properties in the Sikasso Project are considered prospective for orogenic gold style mineralization based on their favourable Paleoproterozoic geology and structure, including their proximity to other mineralized systems in the area. The Ouassada, Sankarani, and Kourou permits contain several historic surface showings and artisanal alluvial and eluvial mines. Modern exploration, using a variety of techniques such as soil geochemistry, lithogeochemical prospecting, and airborne geophysics resulted in the identification of additional mineralization, which has subsequently been worked by artisanal miners at several localities. Bedrock mineralization has been identified on the Ouassada and Sankarani permits, and consists of decimetre wide quartz veins with pyrite. 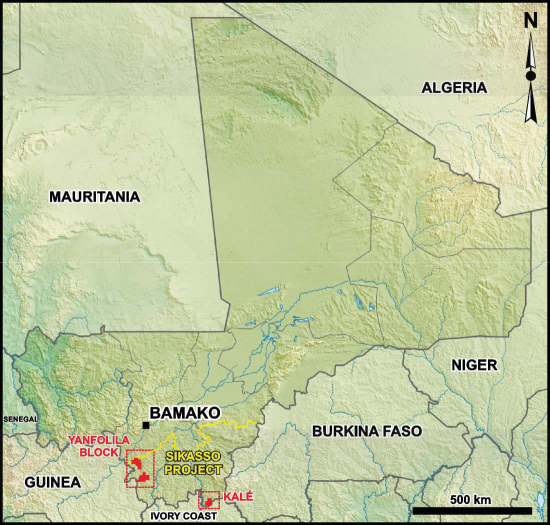 The average gold concentration of 342 artisanal pit samples collected from two prospects at Ouassada (Farabakoura and Kabangué) was 3.11 g/t Au, with a large standard deviation of 6.99 g/t Au, which reflects the “nuggety” nature of the gold. Independent sampling of bedrock and eluvial mineralization on the Property confirmed the previous measured gold concentrations. Interpretation of high-resolution airborne magnetic and radiometric geophysical data has identified multiple exploration targets, particularly in areas with little or no outcrops, e.g. Kalé. 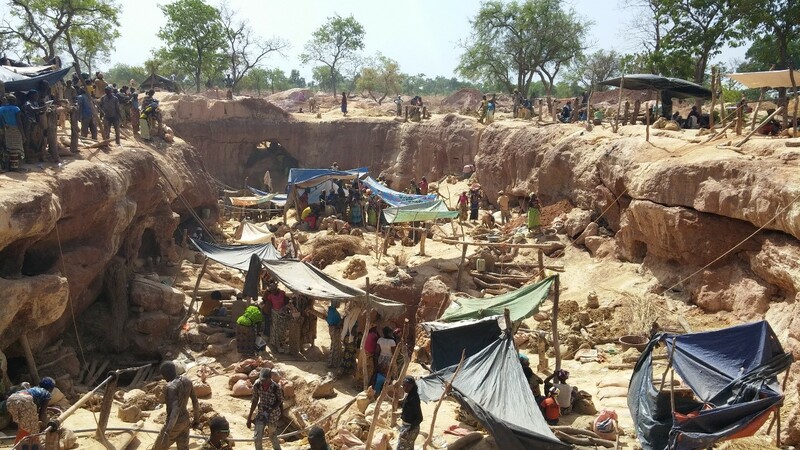 Artisanal miners at the Farabakoura workings on the Ouassada permit (January 2018). The shafts located at the base of the “pit” extend to a depth of 10 m (top of the water table). The property permits were acquired in 2011 and based on continuing work expenditures are in good standing until 2021. 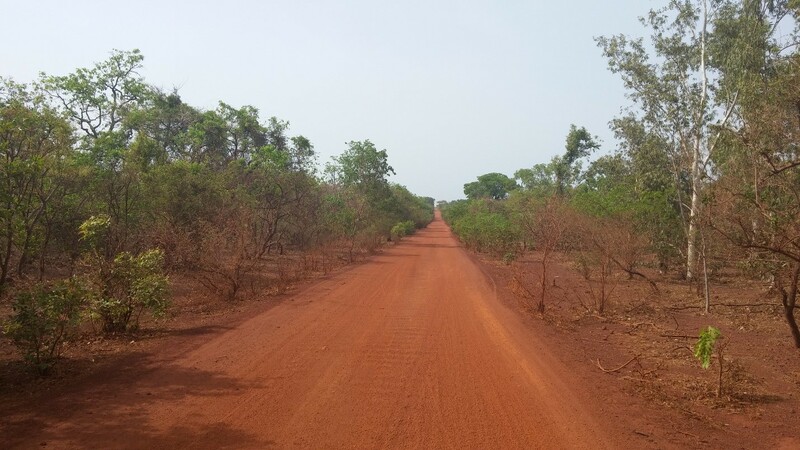 The northern Yanfolila North block is accessed by Route National 7 (RN 7), a paved road from Bamako to Keleya (85 km), followed by 55 km of unpaved road to Selingue. Access within Ouassada and Sankarani is achieved using an extensive network of minor unpaved roads and drivable tracks and footpaths. Access from the north to the main part of the Sankarani permit is via a small motorized ferry at Faraba, or from the south by an unpaved secondary road from Yanfolila. The Yanfolila South block is accessed via the paved RN7 from Bamako to Bougouni, and the RN8 from Bougouni to Yanfolila. Within both permits access is by minor unpaved roads and drivable tracks and footpaths. The Sikasso Property is located on the southern edge of the Sahel, or sub-Saharan belt, and is characterized by a subtropical to hot climate and has dry and wet seasons. The rainy season extends from May to October, with an average rainfall of 800 - 1,000 mm per annum, and a hot dry season from October to April. Mean daily temperatures range from a high of 36°C in April to a low of 19° C in December. Most of the region is devoted to agriculture (subsistence farming), and is planted with maize and cotton with minor areas of brush and trees most commonly located along tributaries and main drainages. Exploration activity can be conducted for most of the year, but during the height of the wet season (July to September) access is difficult, so that most field activities are suspended during much of this period.